Editors Note: Originally published August 17, 2013, it has gotten some attention but not what I believe it deserves. This is a technique I use almost weekly. 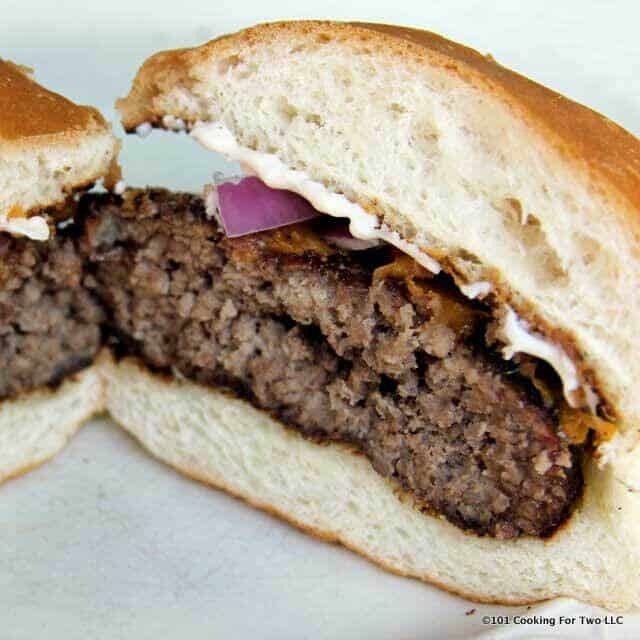 The burger goes from refrigerator to your mouth in less than 20 minutes. So please enjoy learning how I frequently cook at home. If you’re an accomplished griller, just move on. This is a tutorial for newbies and those who just can’t seem to get it right. This is not the gourmet burger. I’m not grounding meat. I’m not stuffing the burger, and I am not mixing in various things. We are going to learn to grill store-bought ground beef and make a darn nice meal easily in a way you don’t have to keep looking back at a recipe. How is that for a goal? Funny story (skip this paragraph if you just want to get on with it). In Lee Iacocca’s autobiography, there is a section that talks about the Ford Motor Company executive dining room having the best burgers ever. When the chef was asked about his technique, he demonstrated the method starting with a whole beef tenderloin going into the meat grinder. Great starts will give great results. I don’t start that way, and I assume you won’t either. I love this… I’m sure I have done this a thousand times. What meat to use for a great burger? Most of us will start with store-bought ground beef which is fine. Use 80/20 ground beef is the easy answer. Skip to the next section if you want. There is a difference between hamburger and ground beef. 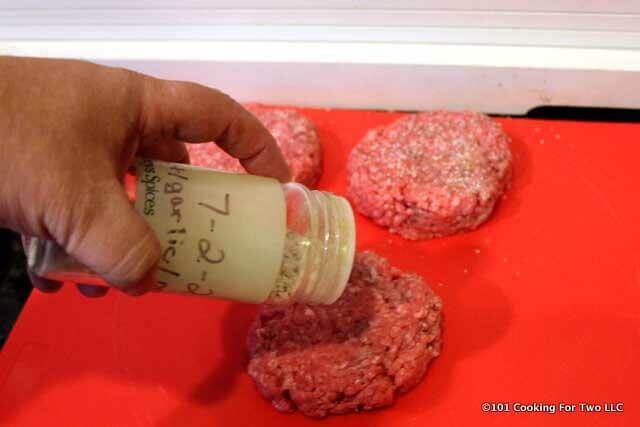 Ground beef has a variable amount of fat, but the fat is from the beef being ground. 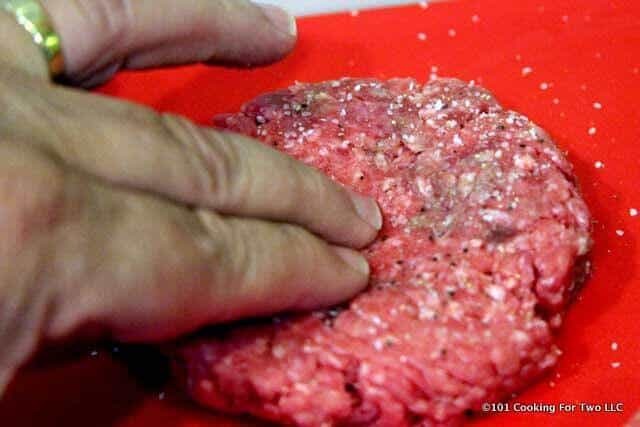 Hamburger can have up to 30% fat and fat, from trimming other cuts can be added. I choose #1, not #2. Most burger gurus suggest 20% fat for the moistest, tasty burger. I think they are right. Fat does taste good. I sometimes go all the way down to 10% and still come out acceptable, but you need to be careful. You can go lower fat by adding something to retain moisture like my Healthy Low Fat Burgers or American Test Kitchen adding a panade of milk and bread. 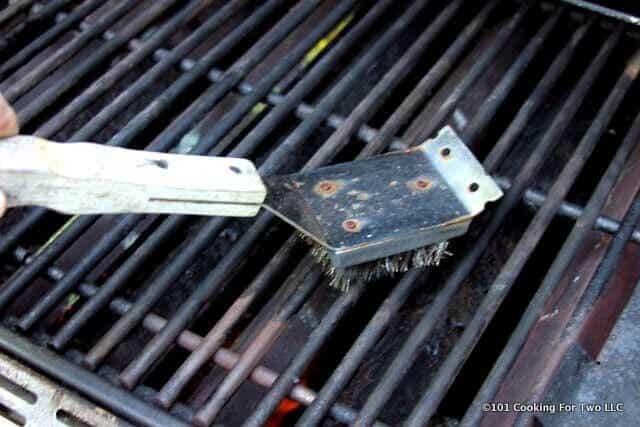 Your grill can be a gas grill or charcoal grill. It does not matter for this to work. Just get it as hot as you can. You may again skip to the next section. 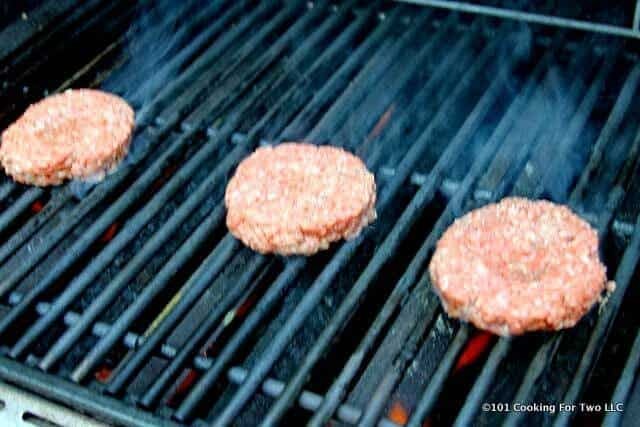 You are cooking a relatively thin patty of meat rapidly, so direct high heat is correct. While my very hot Weber runs 650 degrees plus surface temperature and you might “only” get 550 the results will be about the same. Some gurus suggest you must use charcoal. 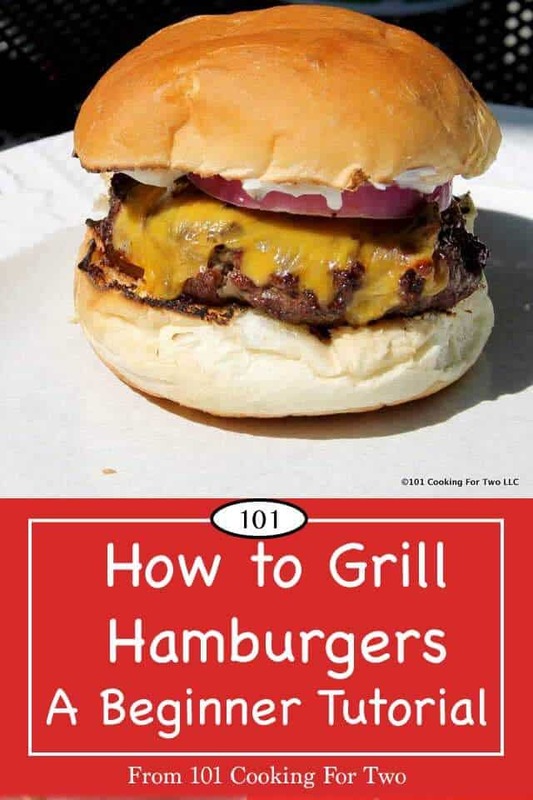 If true, I can’t grill a burger since I don’t have a charcoal grill. Use what you have. Just get it very hot, cleaned and oiled. 165 absolute minimum (but not much higher or you have a hockey puck). No discussion allowed. I’m playing the Doctor card here. You will not eat or serve ground beef that has not reached 165 degrees. I don’t care what some idiot tells you about it tasting better. You can get seriously ill or die. A good thermometer is a must. I use a Thermapen, and it is worth every cent of the almost $100 it cost. But you can get good results for $15. I’m a big fan of good baked goods. A cheap bun will ruin your great grilling. The meat needs to fit the bun. I’m OK with the burger overflowing the bun some, but I don’t like a large bun and smaller burger. Since we are learning the basics, a standard burger bun fits a 1/3 pound burger well, and that is what we will do here. I do like to brown the bun up for a few seconds on the grill. Seasoning, just some salt, and pepper will do. I’m using my Homemade Everyday Seasoning Salt – 7:2:2 since we love some garlic. I’m also adding some cheese just to show you how. The Three Secrets To Getting it Right the First Time. Do not compress the meat. Pat it into shape. If you use a burger press, just use it to shape. 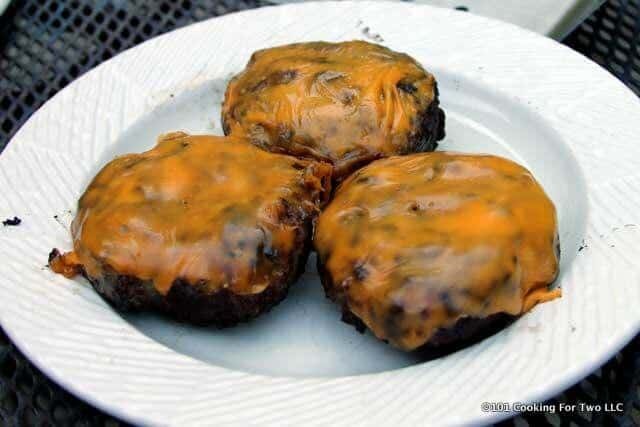 Indent the center of the burger to prevent “puffing.” This seems strange, but it is a must do. Without this, the center will puff up thicker, and it will be hard to get to the correct internal temperature. The outside will almost burn and will dry out. All bad things. I’m starting with a 3/4 inch thick burger and compress a 1-inch diameter area about 1/4 inch. Flip once. Don’t play with your food and don’t keep poking it to check the temp when you know it’s not done. I think the more you flip, the more juices drain and the more flare-ups. The more pokes, the more moisture drains. Cook for about 5 minutes (I use a watch with a second hand) on the first side, flip and cook another 3-4 minutes on the second side. I then check the temperature and will add cheese the last 30-60 seconds. Like many things, once you get your basic method down then the variations can flow. This is a darn good burger as made and is basically what I have done a thousand times. Not to say it is not a special meal but it is an excellent quick everyday type of meal. I’ll take an excellent meal frequently. But make it bigger, make it smaller, stuff-it or whatever. I won’t tell you this is the greatest burger in the world, but it is very very good. Someday I will try the Ford Motor Company or the American Test Kitchen method. I’m sure they are wonderful, but this is everyday cooking. So let’s do our burgers right. You will be glad you did. Preheat grill on high. Clean and oil. Start with 1 pound 80/20 burger. Divide into 1/3 pound balls. They are the size of a tennis ball. Safety note: Always wash your hands for safety before and after touching ground meat. Pat gently into 3/4 inch thick 4 inch patties. Give them a good sprinkle of salt and pepper on both sides. I’m using my 7:2:2 (salt, pepper, garlic). Press one inch round 1/4 inch deep indentation into the center of one side. Grill over direct heat with closed lid. Flip after 5 minutes. The center one does not have the indentation (more on that later). Grill another 3-4 minutes and check the temperature. Get to 165 then add cheese for about 30-60 seconds if using cheese. The rear burger is the one cooked without the indentation. The burger without the indentation was 145 when the others reached 165. It took two more minutes but more importantly, it puffed about 1/4 inch, was about 1/2 inch smaller diameter and was over charred and dried out the surface. All from the lack of the indentation. I don’t feel a great need to rest the meat before serving. By the time you place it on the bun and do things to it, it has been enough time. Pat gently into 3/4 inch thick 4 inch patties. Wash hands for safety before and after touching ground meat. Give them a good sprinkle of salt and pepper on both sides. I'm using my 7:2:2 (salt, pepper, garlic). Press an one inch round 1/4 inch deep indentation into the center of one side. Grill over direct heat with closed lid. Flip after 5 minutes. Grill another 3-4 minutes and check the temperature. Get to 165 then add cheese for about 30-60 seconds if using cheese. I don't feel a great need to rest the meat before serving. By the time you place it on the bun and do things to it, it has been enough time. Wash hands for safety before and after touching ground meat. As a good general rule, anything over 1/2 inch thick should have a closed lid. So a thin fish filet in a grill basket may not but most everything else should. Do not compress the meat. Flip once if possible. Don't keep poking it and flipping. Nutrition is calculated on meat only. I have a butterflied chicken around here somewhere. While it mirrored many other recipes, I’m not that happy with the technique now. I would start skin up then flip to skin down to get to a near done color then flip back to skin up until 165 internal temperature. All over 400-450 degree grill. BUT I would not do butterflied normally for a whole chicken. Check out https://www.101cookingfortwo.com/grilled-whole-chicken-on-a-gas-grill/ which I now do. The skin is great and meat moist and tender. Hello. Loved the reading. Thank you. I gave up gas grills years ago. I had a hard time cooking on them. Same as a gas stove. I prefer electric. People think Inam crazy hehe Anyway. One thing I like to do when cooking my burgers is use smoking chips. 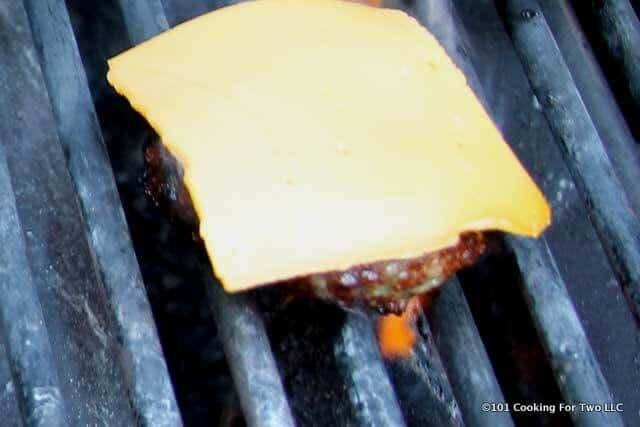 To make a GREAT tasting burger is to butter one bun and put it on the grill to crisp it while the other bun is on top of cheese melting on the burger. Close the lid for a few minutes. If you forget them you will burn your buns hehe I also like to slice onions and cook them under the burgers. I do the same with steak. I am so excited!! This really worked for me me. I am new to gas grills and have been struggling with it. Now I can make an awesome burger that tastes like it was grilled on charcoal. Always love your style. I am bookmarking this recipe. My hubs is not a talented griller and I have never grilled. We are 69 and 52, never too late to learn right? But I just got him a grill we can take in the camper. So we are testing it tonight with burgers. I am hoping our results will be better than in the past! Great tutorial! I like to go back and see what James Beard was suggesting when he started us grilling in our backyards in the 50’s and early 60’s. Few know he is the father, indeed the inventor, of outdoor grilling in America. He thought it was a great place to showcase many of truly American our national dishes. Frequently, I find he already made many suggestions we are only now re-discovering. 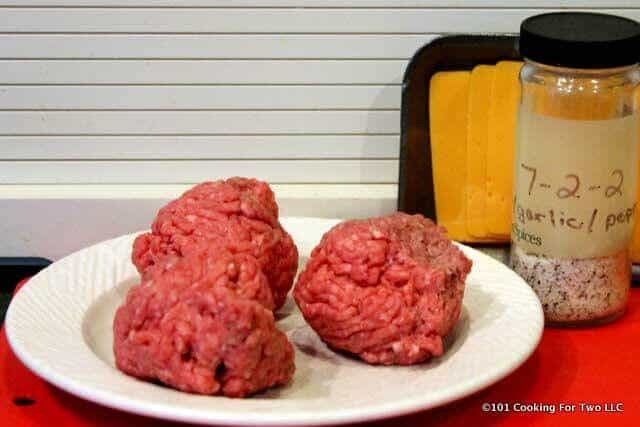 He’d be with you on every point: don’t man-handle the meat, include enough fat, be sure the grill is hot, and make the center of the raw meat patty thinner than the periphery. And please lightly toast the bun, which should be a quality item! 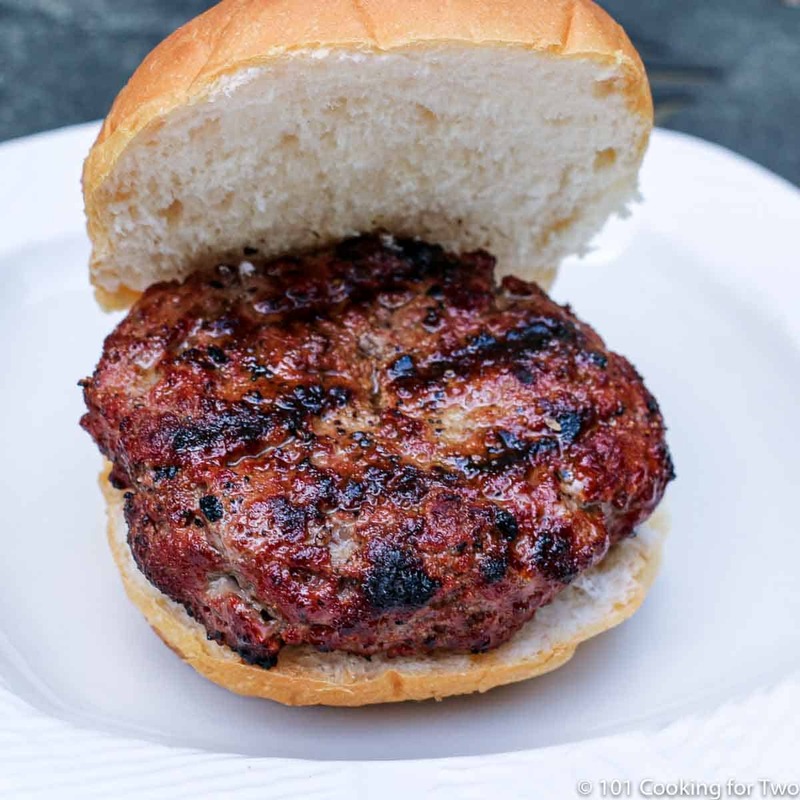 The only thing he’d add, I think, is that if you want a burger with more moisture -especially if you are cutting back on the fat or cooking to “well-done”- try adding a bit of finely minced onion to the burger mix. It only takes a moment, and if you use a sweet onion, there is no added “bite”. I like the boost in flavor as well. Please keep the fine recipes and clear, sensible instructions coming! My burgers continue to shrink and puff up even after indenting the patties. Should the beef be cold or come to room temperature before grilling? Do you close the lid again after flipping the burgers? Any ideas? Thanks! Cold is fine. I don’t rest ground meat to room temperature for safety reasons. Make them a little thinner and the depression a little bigger. Lid is closed. Dan, when you cook these, do you close the lid to the grill? Closed. As a good general rule, anything over 1/2 inch thick should have a closed lid. So a thin fish filet in a grill basket may not but most everything else should. Since I’m aiming at beginners, I have edited the post to be clear. When buying store bought meat, how do you know if it’s 80/20? Would that be the meat that is labelled Lean or Medium? I use three different stores but all label by percent. So the best thing to do is ask them how they label. My usual store also labels by cut. So hamburger is 75/25, ground beef 80/20, ground chuck 81/19 if branded and 80/20 if theirs, ground sirloin 85/15 and ground round 90/10. I usually do chuck. If I’m on a low fat kick, I do leaner but it can taste off some so mostly I use them for other than straight burgers. So you don’t worry about the overall temp of the grill? Webber says 400-500 degrees. Honestly I can’t get mine that hot anyway. I always over-cook them because I don’t want any pink meat. Very few grills won’t make at least 500. But just get it as hot as it will go. I use a grill surface thermometer that is about $8-$10. Never look at the thermometer on the grill hood… useless. Also long as you get 500 plus the 5 minutes on the first side will do. If you can only get 450 the maybe 6 minutes on the first side. If you can’t get 450 then get a new grill. Be sure to use a meat thermometer to determine 165 as the end point. There is no pink at 165. If you go much over that they will start to dry. Notice there is no specific time for the second side. That is were the variation in grill temp and thicken is account for. I found the best grill a number of years ago for my hubby. You can use gas or charcoal. We love it. I bought my son-in-law a combination smoker-gas-charcoal for Christmas… I had it delivered and haven’t seen it yet but hear it is huge. I love my natural gas. Hooked directly to the house and no bottles to fill or charcoal to light… I’m so lazy. Your burgers look delicious and you are right on spot with the 80/20 and the indentation. Just wish I had one now because I am drooling over that photo! I’m surprised about how many don’t know these things many of us take for granted. The indentation is so simple but really important to the final results. Thanks for the comment. Sorry for your loss. Jake lasted another 8 months after that picture. 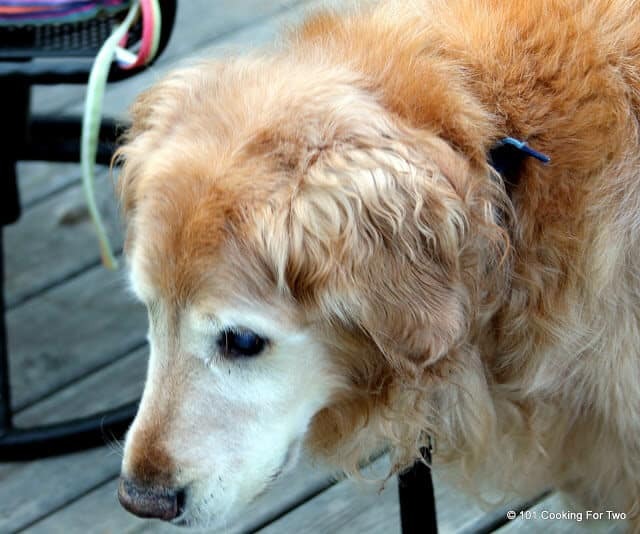 He was blind and had a bad leg but cancer did him in.